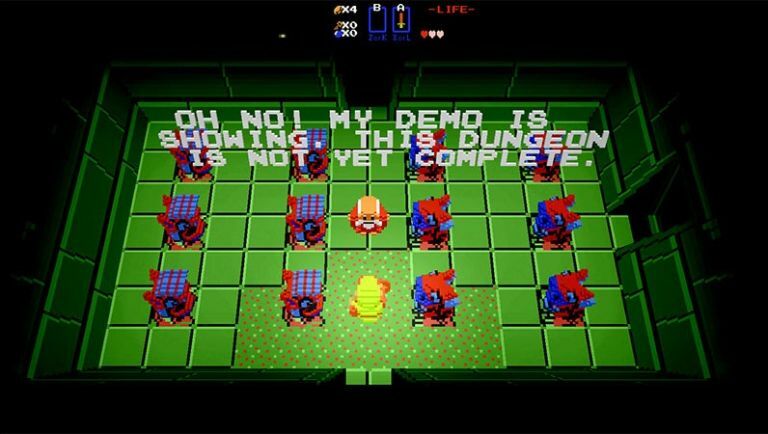 Wow, it really doesn't feel like it's been a whole 30 years since the very first Legend of Zelda game arrived on the NES back in 1986, but here we are, three decades on hoping we get a proper new Zelda come in the next 12 months. And to celebrate this landmark year (before Nintendo hopefully announces its own celebration at E3 in June), two fans have painstakingly recreated the first game in your browser using voxels and all the sound files from the original. Zelda30Tribute is the painstaking work of programmer Scott Lininger and artist Mike Magee, and while the transition to a 2.5D isometric view makes it a little jarring at first if you've played the 8-bit original, it's still pretty rad to be able to play a new take on a classic game right there in your browser. Based on an open-source version of the game, the tribute was built using WebGL and is playable in both browsers and on mobile (thanks to some pretty rad-looking touchscreen controls designed to look like NES controller buttons). Knowing Nintendo and its quick fire legal hammer of doom this brilliant little fan project probably won't last long, so jump on while you can and celebrate 30 years of Link, Zelda and Hyrule.